Design Matters. This is a credo that we live by when we think of our new products. Too often today, manufacturers of industrial products, especially in the lighting industry, seem willing to accept whatever designs they are shown by their overseas suppliers. Inevitably, these products just end up being small tweaks to tired old designs. We believe that good design can and should be brought to bear in the industrial lighting market. The result are products that fill needs our users may not even know they had with products that offer the durability and usability required for tough workplaces. Industry Choice: General Construction Tools & Equipment category winner! Beacon LED Tower Wins Most Innovative Product (MIP) Award! The Beacon LED Tower from Lind Equipment received the 2019 Most Innovative Products (MIP) Award for General Construction Tools & Equipment. Attendees of the World of Concrete show voted for the product they deemed most innovative in each category. Nominees are decided based on innovative features, ground-breaking technological advancements and value in the industry. The Beacon LED Tower, engineered by a lighting company and designed to fix all the issues with traditional metal-halide towers, stole the show and won the title. The Beacon LED Tower began with a simple question. What if a light tower was designed by a lighting company, not a generator company? The answer is a light tower that fully embraces the latest in energy LED lighting technology to be lighter, more portable, and vastly more efficient than the alternatives. One that can be moved around in the back of a pickup truck and maneuvered by a single individual. One that can replace a 4,000 Watt, diesel fuel burning, 2,000lb tow-behind tower with a man portable one that uses just 20% of the energy to produce the same amount of light and can be simply plugged into a socket or run off a generator the size of a suitcase. The Beacon360 Spark is an example what happens when you design a product to fit the way customers work rather than forcing customers to work the way a product is designed. For decades, the workhorse of the jobsite lighting industry has been the 100 foot construction stringlight. The stringlight is, by definition, a one size fits all solution. No matter the size of your work area or the amount of light you need, you get what you get. And when you are done the job most of the string lights end up in the bin. The Beacon 360 Spark changes the equation by offering a modular lighting system that can be spaced as near or as far apart as required and in as long or as short a string as is needed. Moreover it daisy chains easily into other LED Jobsite lights so the Spark becomes a key part of the lighting system for the job. When the project is done, the durable and easily disassembled Beacon 360 Spark can be quickly taken down and used again on the next job. Thus replacing disposable and difficult to use stringlights with re-useable and customizable jobsite assets. Beacon LED Tower’s 2nd Win! Lind Equipment’s Beacon LED Tower has received the 2018 Pro Tool Innovation Awards in the commercial site lighting category. A panel of judges made up of tool and media professionals from across the United States and Canada weighed in on entries from top global manufacturers. 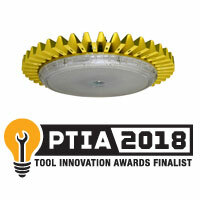 Lind Equipment’s Beacon120 LED Highbay has been named a finalist for the 2018 Pro Tool Innovation Awards in the temporary site lighting category. A panel of judges made up of tool and media professionals from across the United States and Canada weighed in on entries from top global manufacturers. High output LED lights have always required two components – an LED array and a bulky, heavy power supply that provides electricity to drive the array. The need for these two components has driven LED fixture design throughout the history of the technology. The Beacon 120 Highbay changes this equation by utilizing state of the art technology to eliminate the need for an external driver. As a result, the Beacon 120 is able to provide all the same light output as the models it replaces in a much more compact package, all while eliminating a major component (the driver) which can be prone to failure. The Beacon 120 weighs just 2.6 pounds and is only 2 inches thick compared to competitive products that weigh nearly 10lbs, are over 8 inches thick and need 25% MORE wattage to generate the same amount of light. Put simply, the Beacon 120 is easier to transport, easier to install, more energy efficient and more durable than anything else on the market today.